On the back of a miserable Q2 GDP reading and general uncertainty in markets Japan's economy has not exactly been the harbinger of pleasant data reading as of late unless of course you have been short on the Yen. 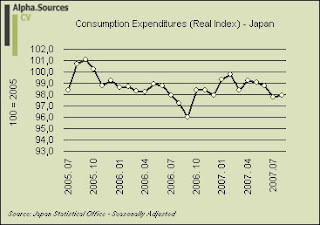 As I said in a recent small post on Japan Economy Watch this week would bring some pretty interesting data releases from Japan in terms of figures for prices, consumption expenditures, industrial production and unemployment. In this small piece we will take a look at the first two and as prices, consumption expenditures go along I will add the latter perspectives in updates to this post. Beginning with prices the overall picture did not change much in August with the reported benchmark index (general index excluding fresh food) staying flat at a -0.1% rate of deflation. The core-of-core which excludes both fresh food and energy rebounded to a rate of -0.2% from last month's -0.5%. 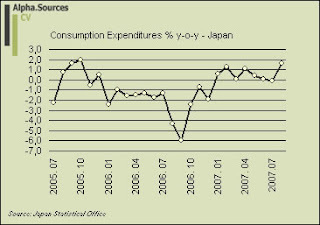 Turning to readings on domestic demand we also see from the basic headline reported in the media that domestic consumption expenditures rebounded to a 1.6% increase on a y-o-y basis. Now, compared to recent months' rather sub par performance this is indeed something of a rebound and for good measure I also reproduce the graph below which contains the figures which are widely reported by the media. However, since we are after all in the business of doing sound economic analysis (aren't we?) we might also want to look at some more solid measures of the trend in domestic demand. 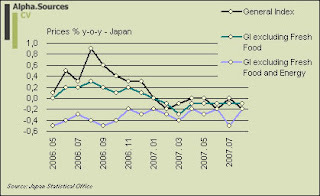 First of all it might be a good idea to incorporate some kind of seasonal adjustment to the data series especially since we are now, as can readily be seen from the graph above, moving into a territory where y-o-y nominal unadjusted figures are bound to get some headwind from what is clearly a rather distorting v-shape as domestic consumption apparently tanked in the middle of Q3 in 2006. In this way, why don't we have a look at the index-2005 series which is furthermore seasonally adjusted. As we can see below domestic consumption did indeed climb in August but not in any way did it climb to the extent that we are led to believe. 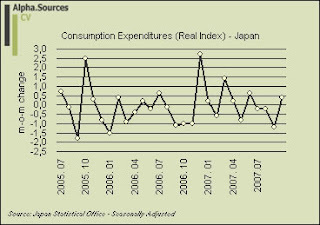 In fact, we see that general consumption expenditures still remain on a downward trajectory relative to the beginning of the year. Finally, and to hammer my point down we could also go back through the underlying consumption indicators (Preliminary Report on the Current Survey of Commerce for August 2007) and take a look at sales for retailers, wholesale, and commercial sales. As Edward notes in a small pointer over at Japan Economy Watch retail sales did in fact manage to clip in a 0.5% increase y-o-y but also that total volumes of sales actually fell from July. In fact, if we look across the board total volumes of wholesale sales, commercial sales, retail sales, as well as sales from large retail stores all fell from July in total volumes in fact extending 3 to 4 monthly declines for all series. So this is just to say then that behind the reported headlines lies a reality which is a bit more differentiated than is many times suggested. Moving on for a minute to corporate capex proxied by industrial production August saw a hefty rebound but we need to remember that this figure also somewhat has earthquake rebound written all over it. As I hypothesised in my previous notes there is a risk that industrial production could begin to trend down as we move into the final months of 2007 on the back of the obvious downside related to the continuous strength of the Japanese export sector.